"This is a year where it's do or die... You either pull what is ailing you down the track with you or you stay home.. You have to make a choice: are you going to make excuses or are you going to go to Beijing"
Gay, Bolt Campbell, Williams Address the Media The highlight of the meet is the 100m showdown between Tyson Gay and Usain Bolt. The women's 100 has a great field (Veronica Campbell, Lauryn Williams, Allyson Felix). A very strong men's 800 highlights the distance action and we give you the letsrun.com predictions. Great men's shot, Liu Xiang in the hurdles versus Terrence Trammell, great women's 100, Sanya Richards in the 400, and Jenn S in the pole vault. *IAAF Preview The Sprints - Jeremy Wariner - LaShawn Merritt Showdown. Everyone knows money motivates Wariner and the $1 million bonus has two of the best in the business squaring off early in the year. Merr itt actually enters with the world leader. 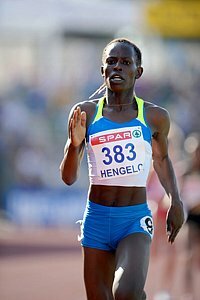 *Athletics Kenya Not Letting Pamela Jelimo Run in Berlin If you want to know what is wrong with Athletics Kenya and track and field, then please read this article.